The Senate Committee on Environment and Public Works held an informational hearing on Nov. 28 that sought suggestions on how to generate funding to support U.S. surface transportation infrastructure needs now and into the future. Carlos Braceras, executive director of the Utah Department of Transportation and president of the American Association of State Highway and Transportation Officials, testified along with Robert Lanham, vice president of the Associated General Contractors of America, and James Corless, executive director of the Sacramento Area Council of Governments. All three stressed that fuel taxes need to be bolstered in the near-term while alternative funding mechanisms need to be explored in the future. He noted that while federal investment has lagged, states have stepped up to “fill the gap,” with 31 states successfully enacting state-level transportation funding packages since 2012. Both AGC’s Lanham and SACG’s Corless made similar points in their comments before the committee. 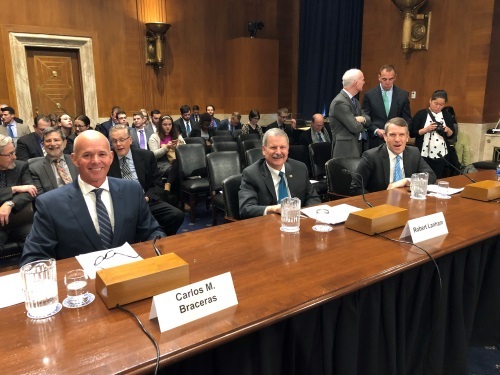 “It is impossible to address the future of the nation’s surface transportation program without first getting to the heart of our biggest challenge: the transportation ‘fiscal cliff’ that’s staring at us when the current FAST Act authorization expires in 2020,” Corless stressed in his testimony. The EPW committee’s chairman, Sen. John Barrasso, R-Wyo., and its ranking member, Sen. Tom Carper, D-Del., echoed Lanham’s sentiment in their comments during the hearing. “I’ve long believed our committee can lead in bipartisan fashion on this issue,” added Sen. Carper.